All schools of martial arts and Krav Maga teach technique. All Krav Maga schools incorporate elements of aggressiveness training. A few also attempt to deal with the element of fear. However most only begin to scratch the surface when it comes to real self defense. To add elements of reality to the training many do scenario training - excellent. Some create environments similar to real life scenarios - Great. But all this is far from enough. The truth is that no matter how strong you are, how fast you are, how many times you have practiced the technique - you will still most likely be caught off guard. What we fail to understand is the huge advantage in the hands of the attacker. We lack humility. We really believe we are all the reincarnation of Bruce Lee. And careless instructors who are trying to sell "self confidence" cultivate a feeling of invincibility in their students, when in fact, this is far from the case. We believe if we train tough enough, run "combat challenges", do "tough man competitions" we will be better prepared for a real life confrontation. But it is not true. None of that will be much of a factor. The survivors who actually lived to tell about it would never even come close to winning those competitions. When the stock market crashes all the geniuses lose money. I know. I was there in 87' and somehow all my brilliant professors lost their money in the market. Why? Because although everyone knew a "correction" would be coming, and everyone planned for that "correction" in the market, when it actually happened everyone was caught with their pants down. All their training did not prepare them for "an the event of a real life crisis..". Same with violence. We walk around unprepared, we train in techniques and methods that are great once you are in the fight, but they do not prepare you to see the attack coming. Now let me tell you something. The pros out there, the ones who want to hurt you, they are ready, you are not. Once the attacker stabs, it is too late for you. You are cut and bleeding. All your toughness is not of much use. You need to be ready for that attack, and you must train in techniques and methods that are simple enough to be employed in that situation. Most people are caught in the kind of situation where, say, you have a great gun but you have no time to get it out and have it ready. So your terrific gun never came into play. It saw no action. It sat on the bench during the game that mattered most. Same with Krav Maga or any system. Great techniques, great fighting spirit but if you cannot bring that into the "game" on time, damn! all that training was a waste. This is where we go beyond technique. This is why our classes are not "all sweat and no talk". We talk, we prepare you for the reality of the situation. You must be looking for the attack, you must have at least a little warning. You must have an "Intelligence system" and an "Early warning system. With some of our instructors, all of whom teach with passion and intelligence. 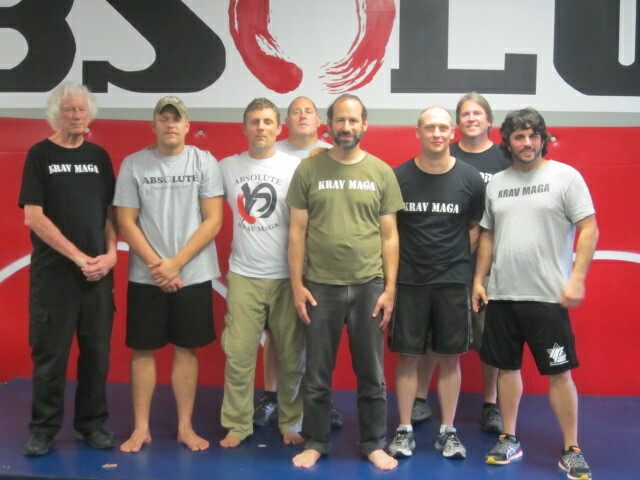 Hal Herndon, Kaleb Young, Chris Cromer, Rob Wallace, Moshe Katz, Tim Garrett, Greg Dillow, Channel Esposito. Southeast regional gathering 2013. Can you imagine a military that has the greatest warriors but no intelligence system, no early warning system, no lookout man. Just wait for the attack and then deal with it. Never! no army has ever operated that way, never. An army would not do well at all if all they had were fighters. What about the un-cool guys in the code breaking department? Nope, do not need them, we are though enough. What about surveillance systems? Don't need them, our guys are really really tough. What about the computer geeks? What about spies, information gatherers? nope, do not need them. It is beyond obvious that an army needs all of the above to protect itself. That is why such systems are classified as intelligence. And yet, nearly all fighting styles totally ignore this aspect. Class begins with fitness, stress drills, hitting the bag, pushups, all great, but not nearly enough intelligence. What we need to improve on is how to see an attack coming, how to profile, how to intercept before the attack reaches you. We need to train with Intelligence. If your country cannot defend itself without these elements why do you and all your instructors think you can? At IKI we add the Intelligence. We are "the other guys". Tour and Train participants from all over the world. In this photo, US, Israel, South Africa, Slovakia, Italy, Netherlands. 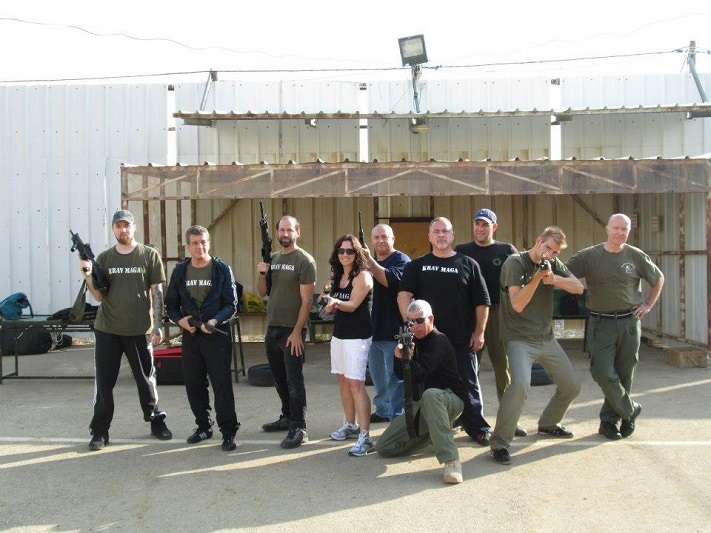 Come to Israel and join us for 10-12 days of intensive Krav Maga training combined with learning about the land and people of Israel. $1,400 includes the entire basic program. (not including flight, room and food). All accommodations arranged for you.